It was Franklin Roosevelt’s yearly tradition to go back to Warm Springs, Georgia, and celebrate Thanksgiving with the patients and staff at the polio rehabilitation center he had founded there. The patients would always prepare a little program with skits and songs, and FDR would carve the turkeys himself. 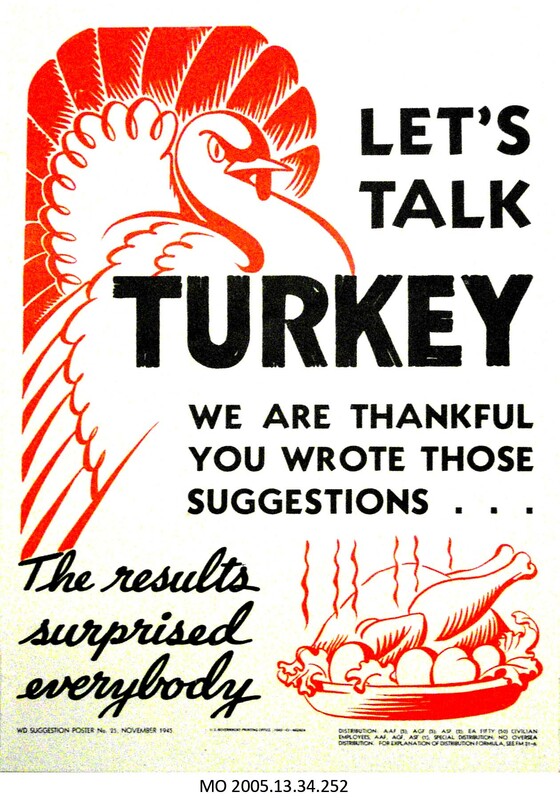 Thanksgiving 1941, though, had been much postponed. FDR’s original plans to travel to Warm Springs had been interrupted by urgent matters in Washington–the tensions with Japan were reaching a critical stage. 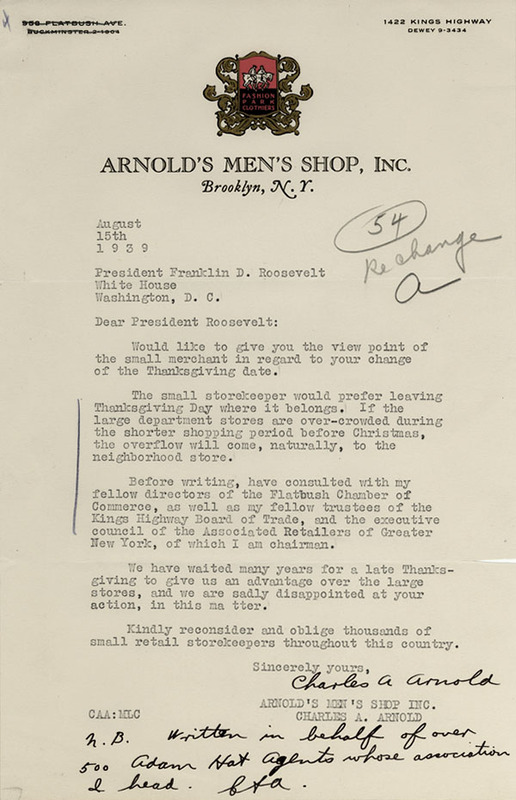 He had delayed his visit by a week, but FDR finally arrived in time for a rescheduled Thanksgiving dinner on Saturday, November 29th. 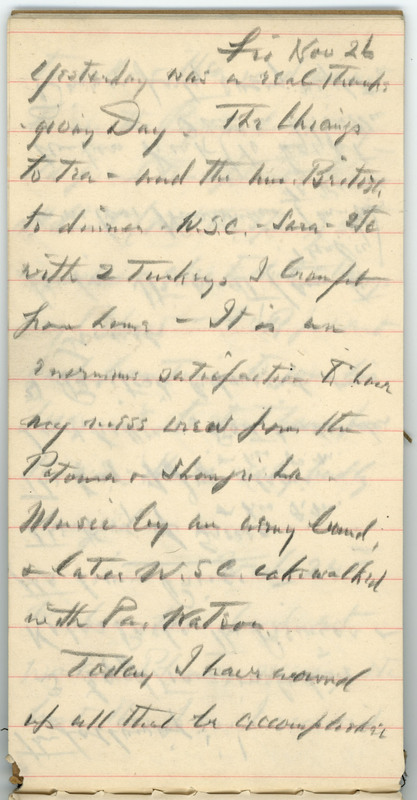 This is a transcript of President Roosevelt’s extemporaneous remarks made at Thanksgiving dinner following the skit. A somber FDR reflects on how the rehabilitation center has grown and evolved through the years and on the simple pleasures of an American Thanksgiving and traditional football games. But the war clouds looming on the Pacific horizon weigh heavily on him, and he expresses his fears that the boys playing football that day may be defending American liberties the next year. FDR’s comments were prescient. The President had hoped to stay in Warm Springs for several more days, but he was urgently called back to Washington by his Secretary of State. He left Warm Springs the very next day, on Sunday, November 30th–exactly a week before the attack at Pearl Harbor. As he said goodbye to his Warm Springs family, FDR declared “This may be the last time I talk to you for a long time.” He would not return to his beloved Warm Springs until 1943. During World War II, the U.S. Government created a wide range of posters aimed at inspiring Americans to contribute to the war effort. Many concentrated on increasing defense production. As the war progressed, new initiatives and methods for improving production were embraced. Ideas were collected from all sources, including civilian employees. This poster was one in a series of Suggestion Posters created by the War Department to encourage civilian employees to make suggestions on how to increase productivity. It was displayed in the offices of civilian employees to thank them for their contributions. This poster is part of a large collection of posters donated to the FDR Library by the Adriance Memorial Library, Poughkeepsie, New York in the 1960s. 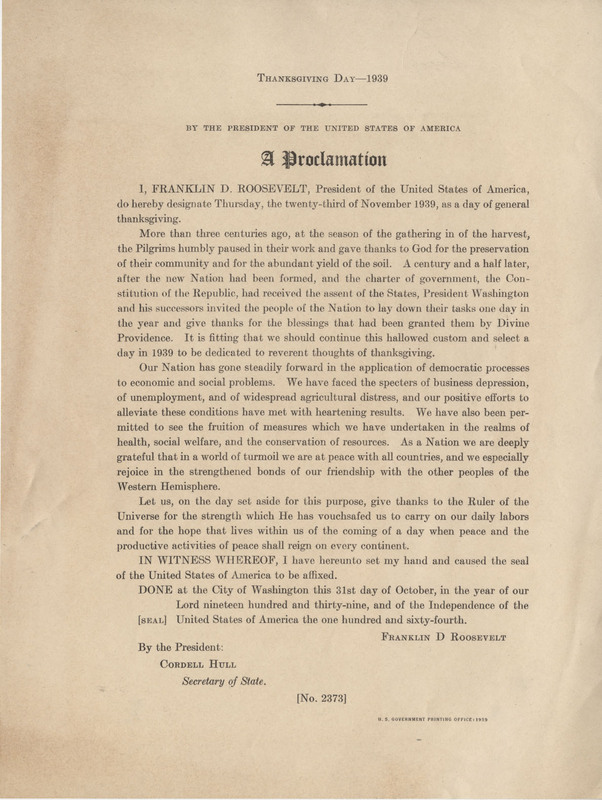 At the beginning of Franklin Roosevelt’s presidency, Thanksgiving was not a fixed holiday; it was up to the President to issue a Thanksgiving Proclamation to announce what date the holiday would fall on. President Abraham Lincoln had declared Thanksgiving a national holiday on the last Thursday in November in 1863 and tradition dictated that it be celebrated on the last Thursday of that month. But this tradition was difficult to continue during the challenging times of the Great Depression as statistics showed that most people waited until after Thanksgiving to begin their holiday shopping. Roosevelt’s first Thanksgiving in office fell on November 30, the last day of the month, because November had five Thursdays that year. This meant that there were only about 20 shopping days until Christmas; business leaders feared they would lose the much needed revenue an extra week of shopping would afford them. They asked President Roosevelt to move the holiday up from the 30th to the 23rd; however he choose to keep the Thanksgiving Holiday on the last Thursday of the month as it had been for nearly three quarters of a century. In 1939, with the country still reeling from the effects of the Great Depression, Thanksgiving once again threatened to fall on the last day of November. This time the President did move Thanksgiving up a week to the 23rd. Changing the date seemed harmless enough but it proved to be quite controversial as can be seen in this letter sent to the President in protest. As opposition grew, some states took matters into their own hands and defied the Presidential Proclamation. Some governors declared November 30th as Thanksgiving. And so, depending upon where one lived, Thanksgiving was celebrated on the 23rd and the 30th. This was worse than changing the date in the first place because families that lived in states such as New York did not have the same day off as family members in states such as Connecticut! Family and friends were unable to celebrate the holiday together. “WASHINGTON, Wednesday—…There are some on this Thanksgiving Day who will feel that everything for which they might be thankful is overshadowed by the loss of some young life, either in the process of training or in the actual fighting. But even to those who are sad, there is reason for thankfulness in the thought that the cause for which their loved ones died is triumphing. We can be thankful that in the whole length and breadth of the nation we have been saved so far from enemy bombing and enemy attack. We can be thankful that our transportation system still allows us greater comfort and less sacrifice of our usual mode of living than any other transportation system in the world. We can be thankful that though we may have had to change our food habits somewhat, we still have plenty to eat. We can be thankful that there is still laughter and humor and gaiety in many homes in the United States. We can be thankful that even our soldiers in faraway places who haven’t seen their children have the assurance that these children are growing up to carry on the traditions for which they are fighting. We can be thankful that there is a growing sense of responsibility on the part of our citizens, and that they realize more day by day the importance of preserving their freedom through active participation in their government. We can be thankful that we ourselves have health and strength; that there are people left at home with whom we can share our love, our joys and our sorrows. We can be thankful that we live in the United States of America with its traditions which accept the perpetual striving for freedom and justice for all. We can be thankful for our ability to work for the blessing of God on our country, which is a promise of happier days to come. “HYDE PARK, Friday—…I have noticed some comment in the newspapers on the change of the Thanksgiving Day date and today I get a most amusing letter attributing this change to a desire to help a certain race in this country, which is credited, in this note, with doing most of the “trading” and which, they say, is not interested in American traditions. Of course, I thought it was just Thanksgiving Day which was a tradition with us and not any particular date, for that has always varied. I think I can give thanks equally well a week before the last Thursday in November if that happens to make a slightly better division of the holiday season.